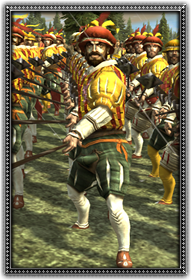 Tercio Pikemen are well renowned, highly disciplined professional pike troops with a fierce reputation, often supported by gunners. These pikemen are superior fighters equipped with a pike and protected by good armour. Able to present a wall of deadly pikes at oncoming enemies, this unit will give any charging cavalry second thoughts.